When planning the arcade heating technology for the residential and commercial building in Bülach, the following requirements had to be taken into account: the maximum generation of renewable energy, supplemetation of the energy‘s shortfall solely via gas heating, as wellas the minimisation of the running costs. Furthermore, the entire system, i.e. all the components, should if possible be sourced from one manufacturer, who also ensures that the system is reliably ser viced and maintained. 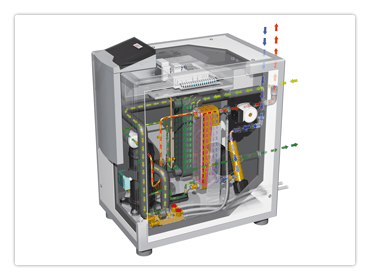 The solution that met all the customers’ requirements came from ELCO – in addition there have been a R600 gas condensing boiler, a heat exchanger and two AQUATOP T brine-water heat pumps offering an excellent value for money. For technical reasons the boilers and heating circuits had to be lined up into cascade and to be separated from each other. Due to this separation of the systems no filthy water can enter the systems and this causes an extension of the device life of the plant. Finally this has as a result a general boosting of the total system.